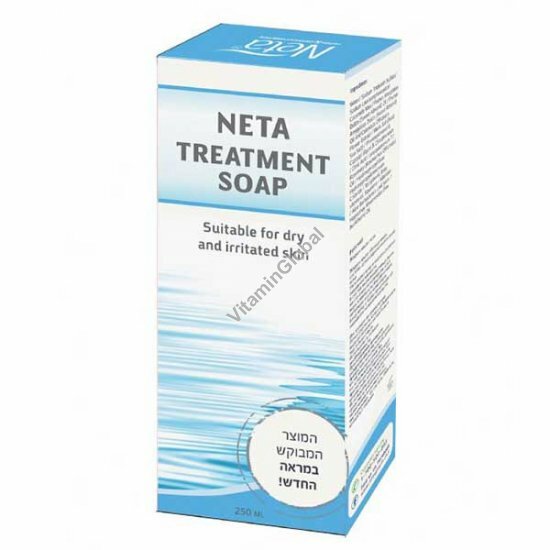 Neta's Treatment Soap for dry and irritated skin is preservative-free and paraben-free. This therapeutic body wash is enriched with plant extracts, vegetable oils, and Dead Sea minerals. The high concentration (25%) of active natural ingredients effectively disinfects, while softening, soothing and restoring dry and sensitive skin. Neta's patented formula is suitable for use in children and infants, and people of all ages with sensitive skin. Active Ingredients: calendula oil, almond oil, sea buckthorn oil, grape seed oil, lavender oil, aloe vera, coconut, Dead Sea minerals, seaweed extract, cucumber extract, guar well, and vitamin E.
Instructions for use: Wet the skin, add a dab of liquid soap, lather, and rinse. Use as needed.